Playwright Marty Chan came to a special evening reception at Historic Joy Kogawa House on March 30, to discuss his new play The Forbidden Phoenix, currently being produced by Gateway Theatre in Richmond. 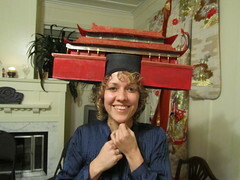 “They are the best costumes” that Marty Chan has seen, of the three different productions for The Forbidden Phoenix. 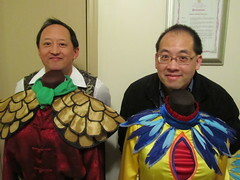 Marty Chan and Todd Wong are impressed with the “Phoenix” costume for the musical play “The Forbidden Phoenix” written by playwright Marty Chan. They both love Chinese Canadian history, and Chan has written a fascinating father and son story, while incorporating both the story of Chinese building the railway in Canada, and a visit from The Monkey King to Canada. and Marty discussed the graphic novel American Born Chinese, which interweaves 3 different stories and incorporates The Monkey King. 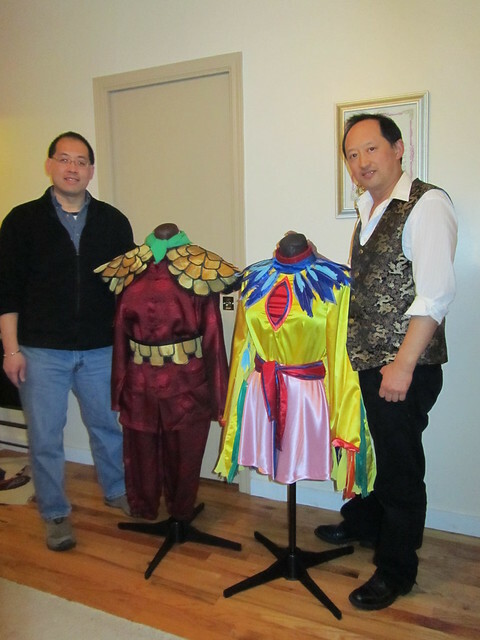 Todd Wong and Marty Chan “ham it up” by standing behind the wonderful costumes created for “The Forbidden Phoenix”. Todd stands behind the Monkey King costume and Marty is behind the Phoenix costume. This entry was posted in Main Page on March 31, 2011 by Todd. 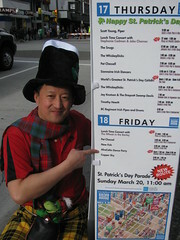 Playwright Marty Chan (Mom, Dad, I'm Living With A White Girl) is coming to Historic Joy Kogawa House. This is a special reception, hosted by Kogawa House Society. Marty is coming, and so is the costume designer. They will talk about this new exciting play about the Chinese immigration to Canada, and how Monkey King is involved. The evening is moderated by Todd Wong, creator of Gung Haggis Fat Choy, and who is active on the executive boards of Asian Canadian Writers' Workshop, Historic Joy Kogawa House Society and The Land Conservancy of BC. 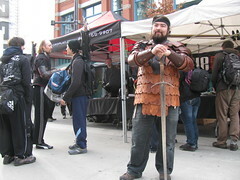 Todd loves is a 5th generation Chinese Canadian, and loves Monkey King stories and Asian Canadian history. at Historic Joy Kogawa House, 1450 West 64th Avenue, Vancouver. Historic Joy Kogawa House, which September 15, 2011, to April 15, 2012.
spectacle combine for a unique evening of family entertainment. at the Gateway Theatre in Richmond. and the search for heritage and cultural roots. 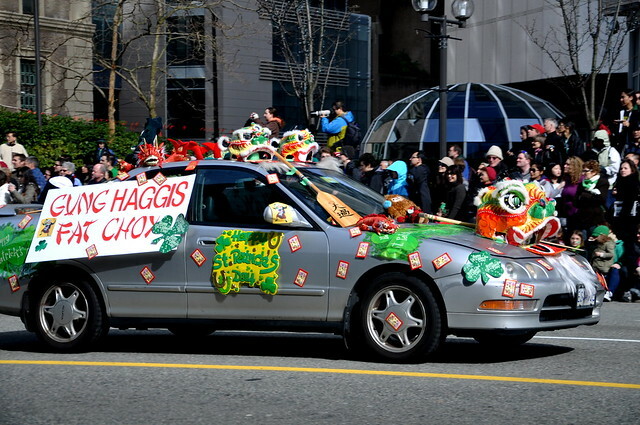 This entry was posted in Asian Canadian Cultural Events, Chinese Canadian History, Joy Kogawa & Kogawa House, Literary Events, Main Page, Multicultural events, Upcoming Events on March 29, 2011 by Todd. proudly made it to Rec B medal finals! Zone / South East False Creek Community Centre. overall, and 1st in the steering challenge race. 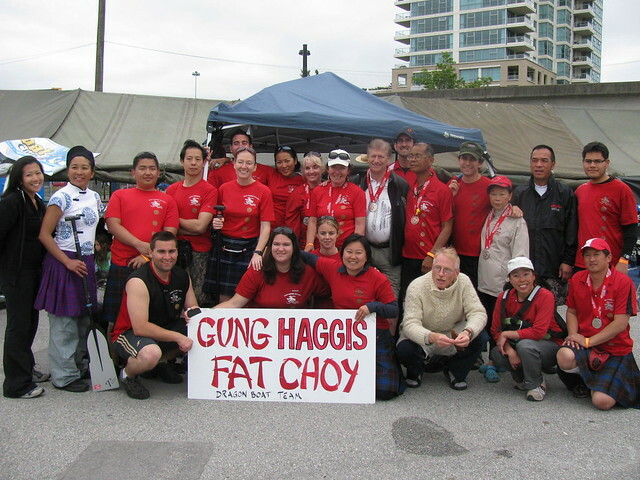 This entry was posted in Dragon Boat Information, Dragon Boat photos 2003, Dragon boat with Todd Wong - Dragon Boat Coach, Gung Haggis dragon boat team information, Main Page, Upcoming Events on March 25, 2011 by Todd. Vancouver. 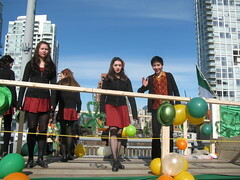 The most spectacular Irish celebration in western Canada. between Drake and Georgia Street on Howe in downtown Vancouver. The St.
some estimated to be over 200,000.
on her own production, Celtic Blaze and as a main violinist in BowFire. This entry was posted in Main Page on March 23, 2011 by Todd. 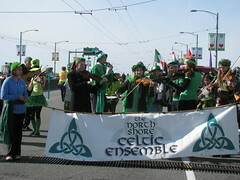 Celtic Fest Sunday – join the Gung Haggis entry #84 in the St. Paddy's Day Parade, or cheer us on! 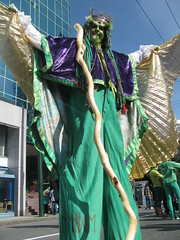 Hope you all can wear some GREEN too! 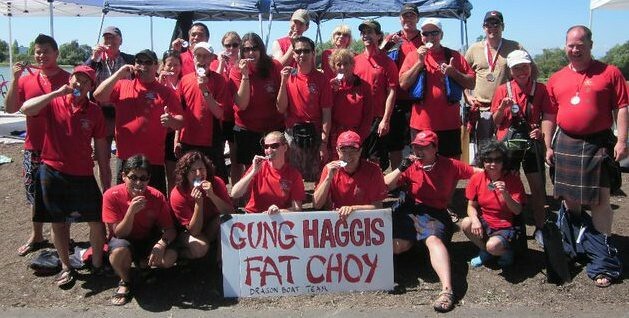 for entry #84 Gung Haggis Fat Choy. workshops etc… on Granville St. 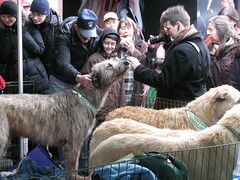 This entry was posted in Main Page on March 19, 2011 by Todd. dancer + Amy Stephen on accordion + more! 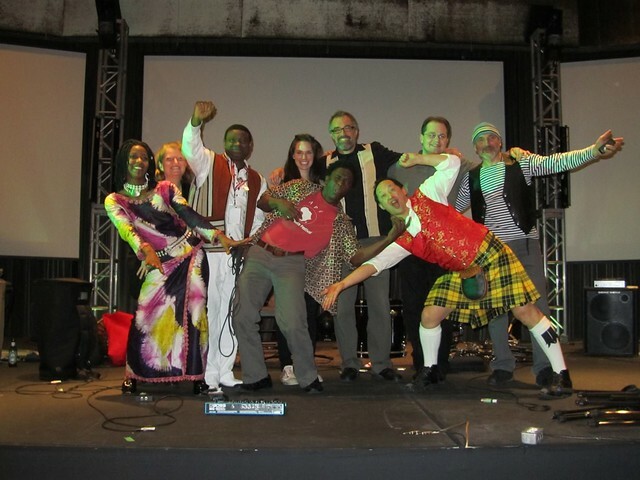 This is cultural fusion to dance to! Years ago I would listen to Afro Celt Sound System – very cool. 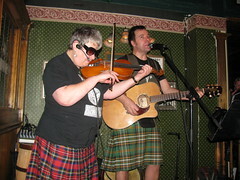 Afro beats set to great Celtic fiddling. 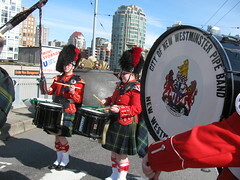 Vancouver & BC's history is Afro-Celtic. Sir James Douglas, founding governor was born in Guyana to a Carribean Creole mother and a Scottish father. In Canada, his wife Amelia was a Metis. Very Canadian! 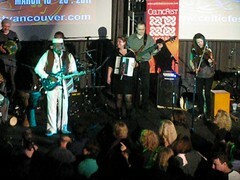 On stage are JUNO Award-Winning West African guitar maestro and singer, Alpha Yaya Diallo, former Mad Pudding band mates Amy Stephen (accordion), Allan Dionne (drums), and Boris Favre (bass), Ottawa Valley fiddler and step dancer Stephanie Cadman, world percussionist and multi-instrumentalist Boris Sichon, African dancer N’ato Camera and percussionist Yoro Noukoussi. and a night made for dancing is born! 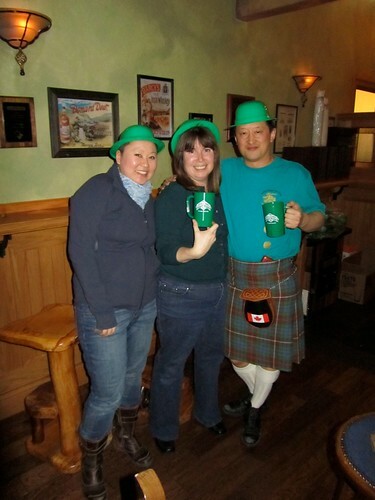 Your host for the evening is Todd Wong AKA Toddish McWong. 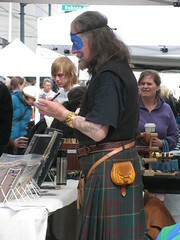 boundaries and create musical alchemy at CelticFest. This entry was posted in Main Page on March 18, 2011 by Todd. 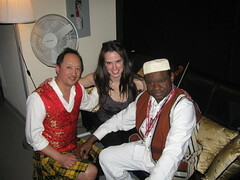 N'Nato Camara and Todd Wong, improvise some dance poses. 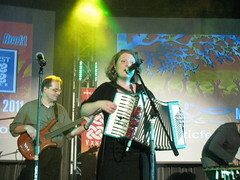 Amy Stephen plays her accordion! success since, picking up three nominations before winning a BRIT Award, and a Grammy Award nomination. She is also the recipient of an Ivor Novello Award. This entry was posted in Main Page on March 17, 2011 by Todd.